Imagine a young artist enrolled in a postgraduate Fine Art course. Everything discussed during class creates an atmosphere that seems hypothetical. It feels, to all intents and purposes, like a philosophy course. It is not that he is not requested to make anything exactly. He and his classmates work with theory, text, but also some materials. These things are combined as works. These works are discussed strictly in terms of the possibility of constructing meaning and shaping thought. For him this feels like an intellectual way of making art. Sometimes, he thinks there is something missing from the process. The extreme priority given to verifying assumptions through research seems to be a way to make sure assumptions are never verified. Ideas are provided only as potential meaning. A lot is thought, but very little is thought through. There are no artists in his family, but his parents are taking care of his art education. He went to many art galleries as a child and later as a teenager trying to imagine how fun life as an artist could be. He wondered at once how difficult his life would be and how free and fulfilling. With time, he started to realize it’s not such an easy question. He should ask himself about the meaning of art. He should find his position with respect to the world’s sociopolitical problems. He should learn how to articulate these problems. He should read more and research more. He should write. He should take a strong position. He should voice some serious problems. He should try to find answers and solutions. What is more, to be able to say anything in art, he should learn how art works. He should talk to people he doesn’t like. He should often be in places he doesn’t want to be. He should do things he isn’t happy with. This was not the freedom, nor the fun he imagined. Was he ready for that? The question of the role of art is as old as art history. Facing many social, political and economical crises, artists have always been somewhere between an idealistic approach to art as a tool to change the World or the romantic, slightly egoistic approach to art as beauty, as resistance. The nineteenth century seems not to have spoiled the human race – so far. Is this particular period in history any different than others? Save the fact that we’re facing one of the fastest moments of technological progress, has our mode of action or brains really changed? Is History something linear, something that has passed and goes forward? Or is it a kind of assemblage, an ongoing process, a repetition of fears, actions, wins and mistakes? If so, how does the technology we face differ from that of the Industrial Revolution? Why do artists keep seeking an answer for what their role might be if they keep failing to find one? What’s happening with artists’ brains? Why can’t they just do their jobs? What is their job? 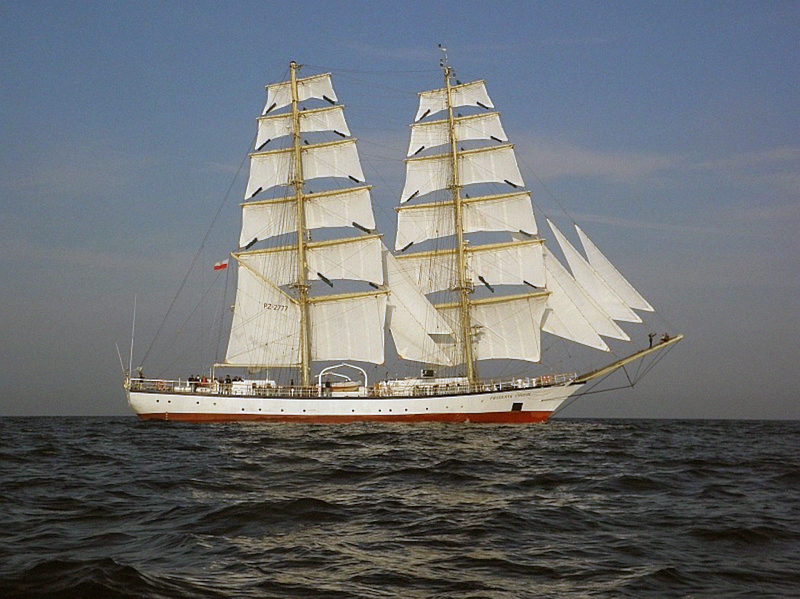 Fryderyk Chopin is one of the biggest ships under the Polish flag. The ship has been used as a training sailboat for youths, part of a free educational programme for talented students. It is a beautiful and dignified ship. One October night it gets into a serious accident on Atlantic Ocean. No one is hurt, but the ship is almost destroyed. After receiving a Mayday call it is transported to a port in Cornwall. The insurance company, proudly presenting its logo on the stern, refuses to pay compensation. The ship’s debt rises dramatically fast. Some rehabilitation funds are collected, but not enough to cover the costs of the accident. Maritime Court arrests Fryderyk Chopin. Even though it’s fit to sail, it can’t come back to its country. He was a very talented, but also a very weak child. The lung disease he had was yet unknown. From his early life he had to learn how to live with the illness, despite the disadvantages. Surely, he was quite lucky to be born into his family. His father was a smart man whose good foresight had him invest in his children’s education, giving them an easier life. Although not aristocratic by birth, he likes to keep in touch with the aristocracy. He can see that some friendships are made for more than their emotional value. Sometimes treated with fear, sometimes with curiosity, his father quickly gained a decent position within Polish society and this French emigrée slowly became more Polish. Ocean Wave was a pocket cruiser. In comparison to Fryderyk Chopin, it would look like a poor sea vessel. But the boat was strong, well prepared and taken care of. Also, the sailor was experienced and determined2. Ocean Wave was later found by Spanish fishermen, crushed and drifting alone at sea. No one could really say what happened. The fishermen towed the boat to the port in La Coruña, where the sailor’s family waited. Before they arrived at shore, Ocean Wave was stolen. The political, social and economical situation in Poland, as well as the rest of Europe, in the beginning of the nineteenth century was quite difficult. Like many others Poland suffered after the adventures of Napoleon Bonaparte (with other supporting characters), dealing with new world orders. Europe, though one of the most developed parts of the then world, faced inequality, poverty, hunger, lack of education access and disease. The French Revolution, one of the most significant historical events, from a contemporary perspective, brought many changes, capitalism among them. The aristocracy took on another meaning. In many countries, a new social class started to appear: the middle class – a dream for the poor and another pawn for the rich. When needed, advocating for the middle class is used in ingenious ways. He grew up in these circumstances, becoming locally famous before he was 10 years old. His father’s connections weren’t of any consequence here. While growing up in Warsaw, the political situation became more difficult. The war was getting closer. He was still very young. Falling in love for the first time, enjoying life, growing as an artist. He wanted to discover the world, evolve as a human, as a composer, as a pianist. He was delicate and fragile. With his bad health he would die rather soon. He didn’t remember the war, even though it left a massive mark on his life. He didn’t remember his dad. The war took his dad away from him at age two. Growing up in a broken family, in times of trauma, wasn’t easy. Leaving for the USA was an interesting opportunity and quite a natural choice for him. With a European look and heritage, talk of him there spread quickly. His art maybe wasn’t the main attraction, not as much as the myth of an exotic, mysterious artist. He never really enjoyed the fuss. He never really wanted to become famous. He never really spoke directly about his story, war or politics. He believed in art. How much can the surrounding reality influence a human’s mind? How much do artists believe in art and mystify its value? How much does art really matter? Can artists really resist? What is the line between resistance and failure? What is the line between mediocrity and craziness? Why does the myth of an artist still occur? Can an artist be mentally unstable or do they have to be unflappable and sneaky? Can ideas of art be romantic? He left full of energy. He left to gain awareness, learn how to understand reality. He wanted to grow as an artist. He wanted to learn what it means to be one. Did he know that he would never come back? Did anyone know? Not sure. He left to search, and being fine with that, or not – he never stopped. Finally, Frederyk Chopin is bought with private capital, and brought back to its country. Anyone can rent the ship for a cruise. The company still organizes the school for youths, and anyone now can buy tickets for the adventure. Paris, the city where everything was happening. At first, he was overwhelmed by possibilities it might give him. He quickly realized that in order to become someone here you need to know how to move about. Not only his talent but also his provenance and appearance helped him in various circles. Talent was the least important quality. He wasn’t high born, that was a plus. Being an aristocrat wasn’t favourable for an artist and brought difficulties in proving yourself a socialist. To be a socialist was a must for an artist. Even if you were using remains of feudal money to support yourself, you shouldn’t voice it. You should actively collect donations from your non-artist notable colleagues at charity events to support the poor.3 Also, the middle class was a new class. What could be a better group for an artist than one that was new? Speaking good French helped him communicate well, almost like a local. The sophisticated tone, taken from aristocratic salons helped him prove his intellectual value. Being an immigrant was quite hot too – especially being half Polish. The country was steeped in total war. The country he missed and to which he couldn’t return. The romantic voice of injury, warnings, myth and pain, all packed together in his art. He also had looks and manners. Being consumptive was so much in fashion. His choice of clothes, very classical, timeless, a quality coming from the need to look good without having to spend too much money was a value too. Not too much a dandy, but always stylish. Was he just lucky, or did he know how to play the game? Maybe a bit of both. Master of a game called how to sell yourself but not make it obvious. California was really into his myth. Not many people understood his art, but he was becoming very popular. The beautiful, sad, blond boy with an exotic past. If he ever wanted to use it, and produce the art everyone expected from him, he could be even more.4 He chose not to. He was happy that his reputation allowed him to be a teacher. He really liked to teach. He saw the purpose in that. Speaking with his students, spending time with them, discussing with them and just not producing, showing and consuming but taking time. Despite its strong critical stances, strong positions, loud voices, critical takes and problematic declarations, art often romances its own counterpoints.5 Many like to believe that without this art wouldn’t survive, art wouldn’t take place. Art wants to be contemporary. Art wants to speak of now. Art wants to progress. Doesn’t this mean a failure to advance? If distance, a wilder perspective, lets us understand history, shouldn’t we think the same of art? He didn’t agree with her, not at all. He wasn’t a socialist, that is certain. He even liked the old social relations, the aristocracy. He always admired them, as the better educated, better raised, more knowledgeable. He also thought the same of George. She also declared herself an independent woman. She could connect with anyone she wanted to and behave any way she imagined. The only person who didn’t believe her was her own daughter. The daughter she hated for not being like her son, being younger, prettier and liked. The daughter she ordered to marry and threw out of the house. He knew that she was not always honest with herself. But her attitude was a winning one. The 1960s in America was a crazy time. Technological progress was at a gallop, supported by a new image of capitalism that was developing extremely fast. The newly ordered world seemed to forget about the horrors of the war quite quickly. The need for fresh, young and modern was stronger than ever. To consume became the most important value, to change and advance raised the price. He was a bit too romantic, too quiet, too much on the side for his time. From today’s perspective you could see that this didn’t mean he wasn’t into the new. His subtle stand wasn’t catchy, or easy to understand. By not being too loud, his voice was too mighty to take. She supported him. She was his closest and most faithful recipient. She was there for him when he worked. She learned with him everything he needed her to learn. She was alone, when he was not there, waiting. Art history rolls alongside history. Can one exist without the other? The historical canon doesn’t take art into consideration. If we assume that art is a response to reality, an attempt to interpret it, must the artist act on the needs of now or observe from the sidelines? How much does history help us understand the contemporary and how do we understand history through the contemporary? Many thought he was quite sceptical about new technology. There was a real boom in the piano market during his lifetime. Top pianists competed with each other as to who was more innovative and explorative. Of course, he couldn’t resist technology, but it didn’t seem to be a key motivation for him. In general, he wasn’t very celebrated. With his strong character, he didn’t want to do what everyone expected from him. He never really followed the trends in music. While famous, he didn’t like to play publicly. He liked to teach. It provided him with money, yes, that too. But, he was really passionate about that. His life’s work, never finished, was a handbook on playing piano. From today’s perspective his attitude towards his practice and teaching methods are considered vastly forward thinking. The new technologies he refused to use mostly no longer exist. History is a strange thing. Maybe, if he wouldn’t refuse what the market wanted to give him, if he would be easier, he wouldn’t die. He would get funds and be better prepared. Maybe the myth is authentic. Maybe he didn’t die. By leaving it to History, it might clarify things. He seemed to like art despite its ravages. Although he would never state it out loud, he wanted to be understood. He wanted to be honest and respond to all the quandaries, but he didn’t know how. He still believed that music had meaning, without seeing any concrete example to prove it. Sometimes he really hates art. He cannot stand its problems, which seem to be so small and silly compared to those of the world. He is not feeling great about the elitist side of art and he doesn’t know how to escape it. He loses the sense of making. He thinks that the problems presented within art discourses are not real, that they are constructed, failing. But sometimes he enjoys it, believes in it and has real hope about it. Those moments trigger all those memories and imaginations of the artist’s life from his childhood. Those moments make him think that art might be this mythic miraculous in the midst of the crisis and the role of an artist is only to search for it. Art often fails. Artists often fail. A policeman has to catch a thief; a doctor has to cure a patient. It is hard not to fail, if you don’t know what your goal is. Art repeats itself. Artists repeat themselves. If you look at that through the eyes of history, through the eyes of art I have failed too. All I have discovered is the unpleasant situation I’m living in. I stand against, not being against. I don’t give any results. I can still hope, that someone through history will describe my stand in a much more sharp and sensible way. Should I, in the meantime, try to find the miraculous, no matter the consequences? 2. See A. Dumbadze, Bas Jan Ader: Death is Elsewhere (Chicago: Chicago Press, 2013). 3. William G. Atwood, Paryskie Światy Fryderyka Chopina (The Parisian Worlds of Frederic Chopin) (PWM: Krakow, 2005), 79–113. 4. Tiernan Morgan, ‘In Search of Bas Jan Ader, the Artist Who Disappeared At Sea’, Hyperallergic, 30 November 2016, hyperallergic.com. 5. See Leon Kahane, ‘Doing documenta in Athens is like Rich Americans Taking a Tour in a Poor African Country’, Spike, 10 July 2015, spikeartmagazine.com. 6. Holland Cotter, ‘Venice Biennale: Whose Reflection Do You See?’, New York Times, 22 May 2017, www.nytimes.com. 7. Barbara Smoleńska-Zielińska, Chopin i jego muzyka (Warsaw: Nardowy Insytut Fryderyka Chopina, 2010), 53–65. 8. See Walter Benjamin, ‘On the Concept of History’, in Gesammelten Schriften 1, vol. 2 (Frankfurt am Main: Suhrkamp, 1974), marxists.org. Agata Cieślak (born Łódź, 1990 currently living in Warsaw) works with narrative and storytelling. She is interested in the relation between historical facts and artefacts, personal experiences, fiction, and falsifying. Her works take different forms – objects, images, performance and text. There is always the possibility that this text could be just an introduction to another story.